In May 1870, the Australian Town and Country Journal reported that the population of Cadia had declined to 150 persons. The village continued to serve the tributers and the families of miners who remained, but the farming community now played a more important role in sustaining the settlement. Nonetheless in December 1891, the Country Trades Register listed W. S. Blood, general storekeeper and postmaster, as the only business at Cadia, though the Register’s entries appear to have been confined to members of the Trade Protective Institute. Having survived the 1890s Depression, the fortunes of the Village looked up again with new mining prospects. On 5 March 1906, it was reported that 160 men were employed at the mine and that there were 260 people within 4 miles of the post office. On 13 March 1908, it was reported that the population was now over 500. A Postal Inspector noted on 30 November 1908 that there had been 300 men at the mine 12 months ago, and a total population of 600, but that it was much reduced by then. On 9 January 1909, the Mine Manager stated that there were now 134 men employed. A temporary slump in both copper and gold meant the population of the village recorded at the 1911 Census was only 153 persons. But later improvement in the copper market renewed mining activity at Cadia. A new hotel was built and shops and other businesses commenced operating. In 1914, the postmistress, Mrs. S. J. Tompkin, recorded that the population of Cadia was about 300 people, with 250 employed at Cadia Mines. The centre of the Village had now moved uphill from the old Cadiangullong Store, closer to the new centres of mining activity. A sketch map in 1914 showed that Chilcott Street now dominated the village. It had a new hotel, hall, two boarding houses, stores, a baker, barber, butcher and two fruit shops. A store and the Post Office was still located in the old Cadiangullong Store building with a baker nearby. The plan also shows a scatter of buildings and huts, with the school on the west side of Cadiangullong Creek, near the new mine workings. The original Mine Manager’s House now served as accommodation for the Underground Manager, with a new Manager’s House at East Cadia. The sketch plan also showed the three operating mine shafts, the Mine Office, Assay Office, the new water jacket smelting plant (Smelter No. 3), the Jacket Managers House, as well as the old reverberatory furnaces (Smelter No. 2). The boarding houses provided modern accommodation for the mine workers, replacing the original miners huts, some of which no longer survived. The village continued to house some of the workforce, though a sizeable number of workmen lived elsewhere, such as Orange. The presence of the railway line from 1919 was a boon to the township. It is not known if the trains ever carried passengers, but they did bring goods into the township. G & C Hoskins had also erected some staff and workmen’s cottages near the railway siding. By 1921, the town had a magistrate, post office, public school, billiard saloon, boarding house, hotel, hairdresser, mercer, public hall, two stores and a Government Savings Bank agency. There were 300 people in the village by 1925, and there were three boarding houses plus three stores and a butcher. Despite the cessation of iron ore mining in the late 1920s, some inhabitants remained at Cadia. According to various individuals cited by Brian French, the village site was abandoned and some of the buildings were burned. Better buildings were dismantled for re-erection elsewhere. The post office and school continued to operate. One store, one boarding house and a hairdresser managed to function throughout the 1930s according to Moore’s Almanac. When the Iron Duke lode was again being quarried for iron ore during the Second World War, the Village was so run down that a camp was built for the employees above Rodds Creek. By 1943, it had fifty tents with boarded floors and sides. There were two dwellings for married men, a mess building, kitchen and bath-change house. This was removed once the work finished in 1945. 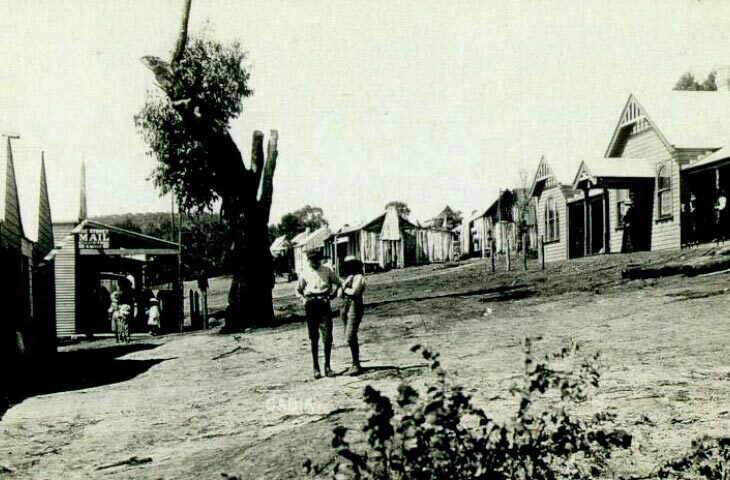 This photograph of Cadia Village was taken after the new hotel was built in 1909. The three gables of the hotel are visible on the right and form a distinct feature of several photographs of the Village. Patrick Tynan was licensee in 1909.